Generally the Blue-front Amazon has a patch of blue just above the beak on the forehead with yellow patches at the top of the wings and blue and red streaks at the tips. The rest of the body is green. The distribution of blue, yellow and red varies greatly between individual birds. Amazons enjoy human contact as well as other birds. They are intelligent and entertaining and curious. Amazons enjoy new toys and activities, they can be excellent at learning to talk. Amazons love to climb, fly, and play. 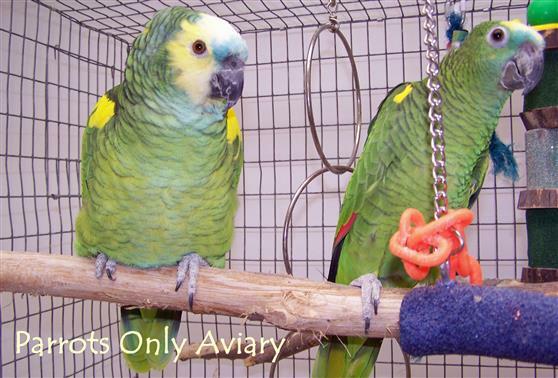 Provide them with lots of assorted toys and wood chews, perches and swings. 40 to 80 years, depending on nutrition and care.